This wedding photos collage depicts the beautiful bride seconds before leaving for the ceremony at Atlantis Pavilions. In the image on the left, her head is lowered and she is either praying or thinking about her future life as a married woman. 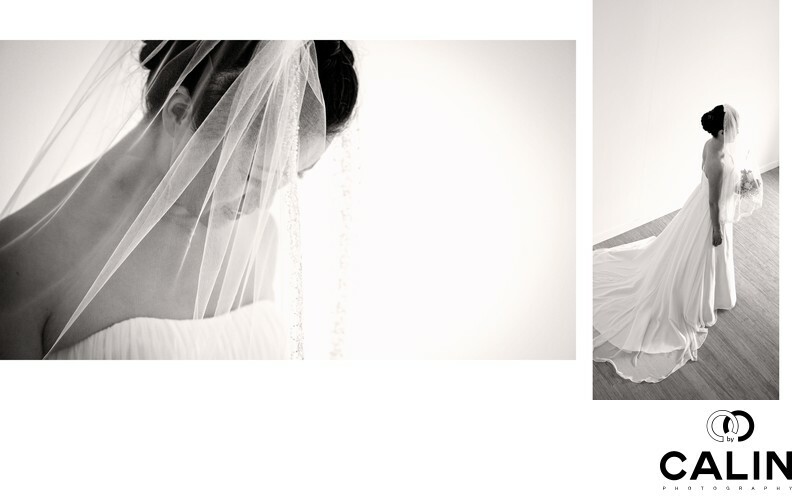 In both shots, the veil covers bride's face and the folds create natural leading lines to her eyes. The photo of the right was taken by the second shooter and was taken from a very high angle. The shot captured the bride standing towards the window and holding her bouquet. The two images reflect a photojournalistic moment and a photographer has to be respectful when such intimate moments occur. This bride opened up and gave us very emotional moments that we captured masterfully in this album spread. To keep in sync with the candid fell of the photos, I chose a black and white processing and I added a bit of film grain to give the shots a timeless look. Location: 955 Lake Shore Blvd W, Toronto, ON M6K 3B9.